All the kits and conversions Im finding are using the M30B34 version of this engine. Anyone know of a suitable setup for the 2.5litre and what the type of HP it could put out at say 17psi? Yeah kinda figured. I presume the 3.4litre is pretty close to a drop in replacement (M30B25 to M30B34), just DME change? Mainly 'cos I think the boost would just make up for the capacity difference as in modern terms they are both antiquated/low BHP NA engines. I wonder if the fact the M30B25 wasnt available in the US is why no one talks about it much, not that its bad candidate for FI? Mounting points not the same (though on the very early B35's they are, but thats a crap shoot as no one can tell them apart), so its not even an easy bolt in? Like, if I "need" to pop in a diff engine but the point is to turbo it, doesn't it make more sense to get a B34, do all the turbo mods and just drop it in and done? If I need to significantly mod an engine to get it in at all, then I prob wouldnt be going for M30xxx anything. Theres a bit of info at the link I've provided, but I agree with Brent. Go for the m30b35, and then see if you want a turbo. b35 has about 60-70 more hp, and alot more torque. We seem to be talking about two different things here though. Turbo'ing the M30B25 as is. I questioned this as the smaller M20B25/27 has no problems dishing out solid BHP under boost, wouldnt a M30 of the same capacity be even better? Also, in theory, wouldnt the smaller bore-same block handle higher levels of boost? But without tuning and parts etc this might be kinda moot for me as I'd rather follow a guide online. M30B34 vs M30B35 swap. The M30B35 swap is definitely do-able, I'm just dubious on the effort when a M30B34 is a drop in swap. Also the easy to drop in M30B34 (in Euro/UK spec which is what I would get) is more BHP/torque than a M30B35, not less (210bhp vs 208bhp). Its got older Motronic 1.0 DME controls but not sure that really matters given FI needs its own control considerations. Brent at BM World has lot's of info/knowledge and quite a few others. I have done a lot of research into M30 B34/35 Turbo and currently building a High HP engine for my e28 and thanks to help from people on the forum made leaps but life has kept project on slow mo. From the research i have actually done the older M30 blocks are more resilient to boost (make of cast materials) vs later model ones, the difference is the heads are better as time goes on. When considering the B35 vs B25 and block size handling more boost, that all comes down to sleeve strength and size and other variables. My interest would be the weight difference as if you could net similar gains to an b35 in reference to displacement you may actually come out better off if they weigh less. Ultimately what i say it comes down to what you want to do, doing an M30B25 would be unique and done right would net you good gains boosted. Hi there! 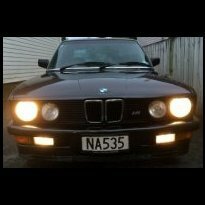 I see you are in Welly too, maybe a good first step would be to meet up, Id love to get a second opinion on whats normal on a B25 performance wise as a baseline as right now its (I would say) unusably slow.